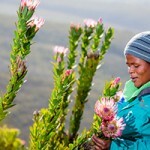 Picking fynbos according to the Code of Best Practice gives consumers the assurance that strict environmental and social standards are adhered to. But building markets for these sustainably harvested fynbos bouquets is equally important. Fortunately there is a renewed drive from retailers to “go green”. And that includes bringing sustainably harvested bouquets into the supply chain. Pick n Pay in South Africa and Marks & Spencer in the United Kingdom, two of the “greenest” brands in the world, already sell these bouquets in their stores and online, with more retailers now looking at supporting ethical bouquets. Commercial pack sheds then sell the sustainably harvested bouquets. Studies show us that, at this stage, consumers are unwilling to pay more for ethically produced goods. Still, if given the choice (and there’s little difference in price), consumers in general do opt for the “green” product. This has also become clear in the rising demand for sustainably harvested bouquets. These bouquets are sold at competitive prices. And sales figures show that the product is becoming increasingly popular. 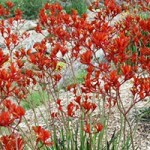 Flower Valley Conservation Trust also works closely with other ethical trade initiatives. The Wine Industry Ethical Trade Association (WIETA) has played a role in offering self-assessment tools to the fynbos industry. The Trust also works with Fair Trade, and currently a Trust member is serving on the Fair Trade Network Board, representing the NGO sector. The industry also offers its own ethical and labour guidelines to harvesters. The SA Protea Producers and Exporters (SAPPEX) compiled a code of best practice for the industry in 2004. These guidelines offer social and labour standards. They are now in the process of being updated through SAPPEX and the PPSA, to make them relevant. As a part of this, the Sustainable Harvesting Code of Best Practice will be included to bolster the environmental element. Like the Sustainable Harvesting Code, the SAPPEX code is not compulsory for the industry. It is there to offer support to industry players, to ensure they meet international best practice standards.